Leather recliners are luxurious, elegant, and look amazing in any type of home décor. These sturdy and comfortable chairs come in a variety of colors and styles to either blend seamlessly in a room, or make a bold statement. If you are looking for a way to show off your new leather recliner, here are some decorating tips that can help. One thing you will want to remember with large overstuffed leather recliners is that they were not designed to be used in small spaces. One example of this is the Flash Furniture Leather Rocker Recliner which measures an impressive 43 x 66 x 39 inches. Rooms with built in bookcases and fireplaces are great for this type of recliner, and normally have the space so you can fully recline. With a throw pillow added to enhance the natural color of the leather upholstery, your big leather recliner will be everyone’s favorite place to sit. Oversized leather recliners are also great additions in master suites. The comfortable chairs are great for relaxing in the quiet of your bedroom, and are available in different contemporary and classic colors. A casual blanket draped across the chair can give it a more inviting look, and darker leather reclining chairs can make a bold statement in light colored bedrooms. 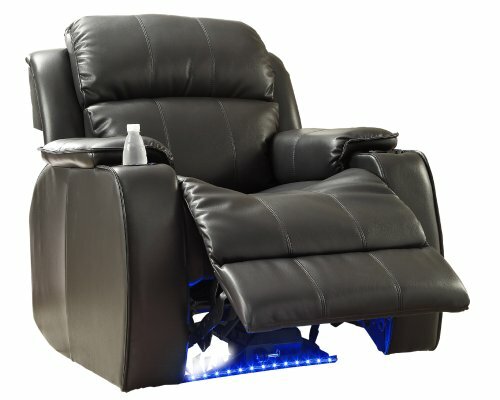 While dens and movie rooms are great places to add a touch of class and relaxed style with the Homelegance Jimmy Collection Upholstered Power reclining Massage Chair. Watch your favorite movies, while being comfortably massaged and when it is combined with furniture in the same sleek style you will have an inviting space where you can relax and unwind. If you have a small space or simply love the clean lines and exposed legs of club chairs, you already know how much fun these recliners can be. Leather reclining club chairs can blend seamlessly into an office or dark wood paneled den, and also add a touch of class and elegance to family rooms and offices. The Lucas Black Leather Recliner Club Chair can add an edgy flair to any room, and looks stunning when a bright colored pillow is carelessly tossed on it. Leather club recliners can slip easily into corners, so you can open up smaller rooms and still have a comfortable place to sit. These recliners are available in bright and neutral colors, and make the perfect accent piece in any home. For an edgier look, place a contrasting floor lamp next to the leather recliner. Large windows with a view are the perfect spot to place your new mission style leather recliner. These recliners are commonly used in southwestern decorating schemes, and add a touch of rustic elegance to your home. While these leather recliners will also look great next to a fire, they can also be found in dens and sitting rooms. These chairs blend well with wrought iron decorations, and many people are finding that bright green potted plants and bold colors help to make the beautiful woodwork really stand out. Since these chairs are generally narrow than other recliners, most people don’t cover them with throws or pillows. Instead with the back and seat of the chair left alone, everyone’s attention will be on the exposed wooden slats and legs. The Santa Fe Chocolate High Leg Recliner is a beautiful classic mission style leather chair that adds an elegant touch to any home. There is no denying it every home décor looks better with a little bit of leather added, and recliners are a comfortable way to add a touch of class and elegance to your home. The most important thing to remember when you are decorating around your leather recliner is to not completely hide it in the background. Bright pillows and throws can tie your new chair into a room, and also help to protect it from dirt and debris. Whatever you style, there is a leather recliner to fit it.